I am a resident of the tropical island of Sri Lanka, and we have a strange traditional method to ripen our banana harvest quickly. 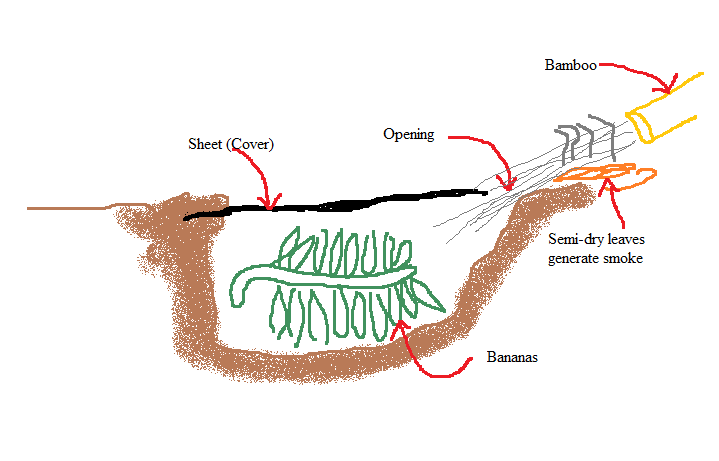 What we do is this: We dig a pit in earth that is enough to put the whole banana cluster in. Then, after safely laying the bananas in the pit, we cover up the pit with a sheet such that only a small hole from a side remains: visualize a small 3-4 inch door to the pit. After that, we light a fire with semi-dry leaves just outside the pit's door. (Semi-dry leaves are used to get as much smoke as possible. Dry leaves do not give that much smoke, because they completely oxidize quickly). And the smoke is sent through the door by blowing it with the aid of a bamboo. This sends a good amount of smoke and warms the inside of the pit considerably. And by experience I can tell you that this makes the bananas to ripen really quickly. I have done a controlled experiment where half of the cluster was not put into the pit. Bananas in the pit ripen overnight and the control sample took days to ripen. Can anybody explain what are the bio-mechanisms that are working here? Ripening of bananas (and other fruits) is induced by acetylene and ethylene (Ethyne and Ethene) (see reference 1), which acts as a hormone and induces the ripening process. The incomplete combustion of the leaves produces ethylene, additionally the warmth of the process will help the enzymes as well. There is even a paper about this technique (although it is unfortunately not accessible), see reference 2 for more information. Smoking Chambers are routinely used in this process, see reference 3 and 4. Effects of smoking on some physiological changes in bananas. Not the answer you're looking for? Browse other questions tagged biochemistry botany or ask your own question. What is the biological name of this plant?